In cases where you want to link one article to another, to give the user some extra information, you can use the interlinking option in the article editor. Like if you were to click here for example, will open another article inside the tab. Select "link to an article" from the available options, then just search for the article or module you want to link to, and you're done! It is also possible to add interlinks manually in articles that are synced in from an external source. This will enable the Assistant to open up a specified article or module when its corresponding interlink is clicked. For these interlinks to work, the Assistant will have to be enabled and active on a page. In the article editor where you have created your content, switch to the code/html view option. In this code/html view, find the text that you want to add an interlink to. If adding a module interlink, take note of the module ID of the module that you would like to interlink. You can do this by heading to the Modules page. 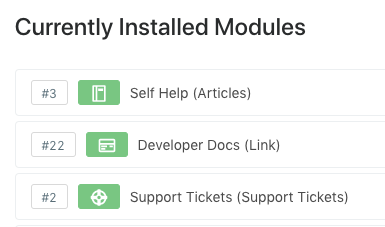 For example, in the below screenshot, 3 is the module ID associated with the module, "Self Help (Articles)". Wrap the text with the following code. In the below example, the text that we are wrapping is "Open Self Help". Use the module ID as the data-elevio-module. Read more here about further customising module interlinks. Or, if adding an article interlink, first grab the Elevio article ID of the article that you want to interlink. You can do this by heading to the Content Dashboard. For example, in the below screenshot, 6189 is the article ID associated with the article, "Overriding the Language for Certain Users". Wrap the text with the following code. In the below example, the text that we are wrapping is "Open Article". Use the article ID as the data-elevio-article. Read more here about further customising article interlinks. Publish your article with your new changes. The next time that your content is synced across, your interlinks will be live in the Assistant.